Once you have decided on a LAKE POWELL HOUSEBOAT VACATION it is time to plan for some fun in the sun! The first thing you want to do when you pick up your houseboat is getting instructions on safety features, how to navigate and anchor your houseboat, and what to do if a storm comes up, the boat breaks down or there is an accident. Being prepared is your best guarantee of having a great trip. Next, you want to ask about policies regarding diving from the houseboat, cruising at night, refueling and the use of personal watercraft and rent a "runabout" boat if you didn't bring one with you. This will allow you to make short trips to the marina or to other areas of the lake without moving the houseboat. Also, you will want to make sure everyone on board has a properly fitted U.S. Coast Guard-approved life jacket (also called a personal flotation device, or PFD). These can be rented at most marinas or bought beforehand. Always keep in mind that being protected will make for a better, less stress trip. Protect yourself from sunburn, insect bites and dehydration. One aspect that most people won’t forget is to have plenty of food and beverages aboard. Plan simple meals with easy cleanup and provide snacks throughout the day. If you are traveling with kids assign each child a "buddy" and tell them to stay together at all times. Giving each child a whistle is also a good idea. A lost or injured child can blow it, to attract attention to his or her location. Provide a wide range of activities. People may get tired of swimming and boating after a time and will appreciate having movies to watch, books to read, board games to play or CDs to listen to. There’s nothing like relaxing on board with a good book, and the lake makes the hours pass gently by. Take lots of pictures. You will love reliving your vacation again and again with pictures. Your time on board may also be spent making scrapbook pages filled with fun stickers, facts, and cutouts for you to glue your pictures too. 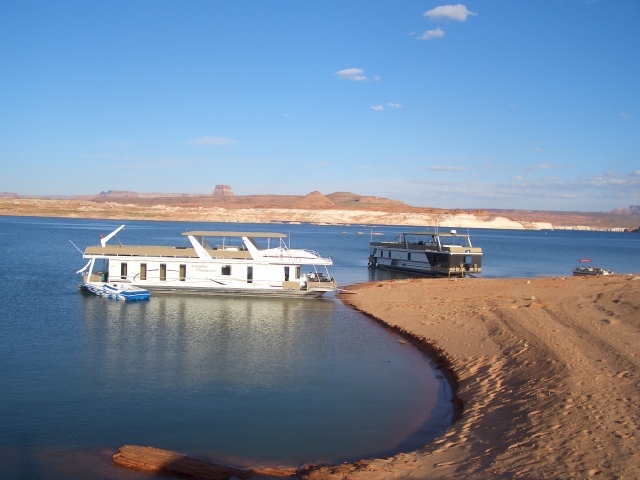 You will most certainly have a fun time remembering your LAKE POWELL HOUSEBOAT VACATION when you have a colorful way to look back and remember these days.